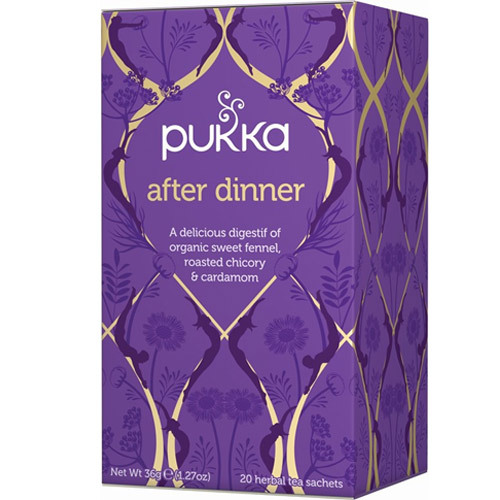 Pukka After Dinner Herbal Tea is a caffeine-free digestif with organic sweet fennel, chicory & cardamom. An aromatic blend full of flavour and incredible. Roasted chicory root (24%), aniseed, sweet fennel seed (20%), licorice root, cardamom seed (8%), orange peel, ginger root. Below are reviews of Pukka Teas Organic After Dinner - 20 Teabags x 4 Pack by bodykind customers. If you have tried this product we'd love to hear what you think so please leave a review.